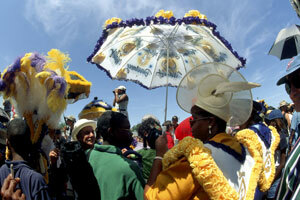 New Orleans Jazz and Heritage Festival | Experience New Orleans! New in 2019, to celebrate the 50th anniversary of New Orleans Jazz Fest, the producers added Thursday to the first weekend. This Thursday will be dubbed "Locals Thursday," which allows anyone with a valid Louisiana ID to purchase up to two discounted tickets at the gate on that day for $50 each. 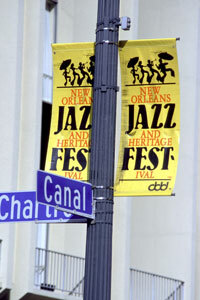 The New Orleans Jazz and Heritage Festival is one of the premier events of the year. Don't miss the great food, crafts, and music that make this festival one of the best the city has to offer! 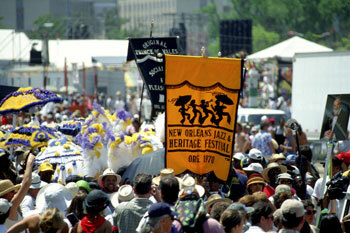 Make plans now to attend the New Orleans Jazz & Heritage Festival. Each year, an all-star lineup of entertainers highlights two special weekends at the New Orleans Fair Grounds. Jazz Fest, like Mardi Gras and the French Quarter, is what makes New Orleans unique and one of the most popular destinations in the world to visit. It connects our community--all ages and races--and showcases our heritage, music and food. The annual festival is held at the Fair Grounds Race Course from 11 a.m. to 7 p.m. on each of its seven days, with artists appearing on multiple stages at the same time. In addition to a fabulous variety of great music, this event is known for its Food Fair, with over 100 offerings of local Louisiana and international foods, as well as a craft bazaar featuring the work of hundreds of local and regional artists. Jazz Fest's featured headliners are generally announced by February or March; however, the complete music lineup always includes great local jazz bands, Cajun and rhythm and blues bands, and the very popular choirs in the gospel tent. 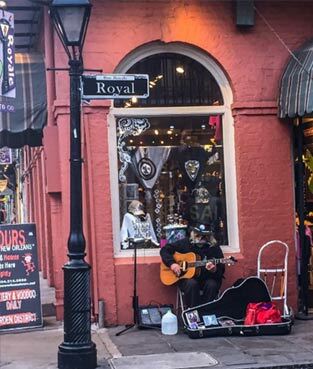 Any time is a great time to enjoy New Orleans, but Jazz Fest is the best time to experience the special uniqueness of the city's culture, food, and above all...our music. There are still some hotels with rooms available. CLICK HERE to reserve directly with the hotels for the lowest rates! 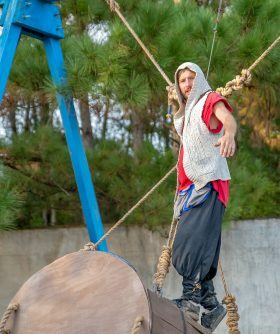 In the Louisiana Folklife Village, master artisans create cultural treasures by using techniques passed from generation to generation. Here, Mardi Gras Indians sew dazzling beaded costumes and boat-builders meticulously transform indigenous cypress trees into the graceful pirogues and skiffs that ply our waterways. In the adjacent Louisiana marketplace, the state's finest traditional and contemporary artists display and sell their crafts. Enter Congo Square through its unique gateways and experience music, art and culture originating from the African Diaspora. The Congo Square stage features performances by African, African-American, African-Caribbean and Latino musicians. Then, savor the unique flavors of Congo food booths while shopping the Congo Square African Marketplace for original artwork, clothing, jewelry, and crafts indigenous to many African cultures. The Native American Village is an invitation to step into the circle that is a jubilant celebration of the heritage of our nation's oldest indigenous cultures. Native American musicians and traditional dance troupes, authentic native art, demonstrations by Louisiana’s elders, and shaded chickee huts create a rich, evocative experience. Heritage Square, near the grandstand, is home to tents featuring gospel, contemporary jazz, and blues, as well as even more food booths. The Contemporary Crafts area, also in the Square, offers alluring handwoven clothing, handblown glass vases and handcrafted musical instruments, along with a brilliant array of paintings, photographs, sculptures and irresistible jewelry. Sink your teeth into tempting po-boys and sandwiches, from the renowned fried oyster, fried turkey, BBQ brisket and muffaletta offerings, to the more exotic softshell crawfish, turkey andouille, cochon de lait and alligator sausage. Sample the international flavors of savory lamb stew with basmati rice, snow crab maki-sushi, jama-jama, nacatamal, falafel, vegetarian spring rolls, and Jamaican jerk chicken. Satisfy your dessert craving with peach cobbler, strawberry shortcake, pecan pie, sweet potato cookies, fresh fruit salad, Louisiana blackberry sorbet, and bread pudding with praline sauce. Take the Jazz Fest Express shuttle, offering continuous, air-conditioned, round-trip service to the Fair Grounds Race Course from 10:30 a.m. till the last festival-goer leaves. A special entrance is available to Jazz Fest Express buses to avoid traffic. It goes straight into the gate where Uber and Lyft can't go. Avoid the surge! Buses depart from three locations. Learn more.